Great quote from the CEO of Manpower today on CNBC. Executive after executive has gone on television talking about how business remains strong. Clients are doing just fine, but somebody else must be having problems since the economy is supposedly lousy. Our clients are telling us that business isn't that bad. It must be the guy down the street who has bad business. The CEO even claims that Europe remains strong. How is that possible? According to him the conversations about business are vastly different than 2008 which remains our thesis. The market has priced in a 2008 scenario already even though it doesn't appear to be a possibility. According to this news last week, Sears Holdings (SHLD) has apparently made a major move on the long hoped for leasing of their under utilized real estate assets. According to the real estate website, it now has numerous leasing options available for retailers at 3,768 locations. Or nearly all existing stores. Store-in-Store Leasing: Establish presence within Sears Holdings Corporation (SHC) store. Outlots: Outlots to build new retail locations. Disclosure: Long SHLD. Please review the disclaimer page fore more details. Most investors have probably already heard about the new oil potential in Ohio via the Utica Shale. Great article in Forbes about the potential for thousands of jobs in this struggling manufacturing state. Would imagine that many a laid off employee in the manufacturing sector could potentially shift to the oil services sector. Sure it'll take training, but the skill set would appear similar. Now if Obama's job ideas would just include money for retraining unemployed workers instead of short term tax breaks. Why does the government always come up short term ideas? Or maybe Obama could just come up with an energy plan to take advantage of the new abundant oil and nat gas resources in the US. Sure he can for through with his green energy plan, but that is a long term plan for 2020 or 2030. What this country needs is a plan to make it to the 2020s living off the fuels already available. Interesting statement from Rio Tinto (RIO) ahead of an investor seminar. In summary, RIO continues to see strong demand for commodities not only now, but over the next 10 to 20 years. On the other hand, supply constraints remain due to regulatory issues, labor shortages, and geology constraints. Based on continued strong demand and supply issues, one would think the stock would be trading towards not only recent highs but also all times highs. That person would be very wrong. RIO is in fact down some 20% from February/April highs and not even close to the highs hit in 2008. The stock market disconnect just doesn't add up. Sure some commodities like Copper have plunged in the last few weeks, but prices remain close to all time highs. Clearly still at prices that suggest very healthy profits. 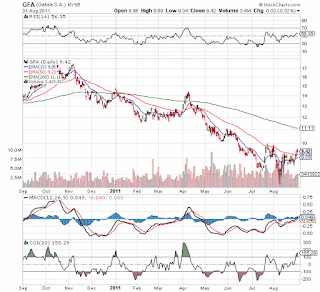 One could easily argue that stock prices never reflected the commodity prices hit in the Spring. Nice to see Sears (SHLD) so involved in the internet and social media realm. This company has a split personality. Go into the stores and it seems like your grandfathers store. Check out the website and it appears like a new age company with a future. As somebody said the other day, SHLD is attempting to become the Amazon.com (AMZN) with brick and mortar locations. Heck, if you can buy online and pickup at the store without really going into it they might just have a fighting chance of a solid retail future. Considering that I don't even count retail as part of the reason to invest in SHLD, any small contribution helps. Nice creative Craftsman music experiment. Not what I'd expect from Sears! According to Intrade.com the odds of Barack Obama being re-elected President in 2012 has dropped below 50% now. Considering he spent most of the year at or above 60%, it shows the significant weakness he has faced as the economy falters. Intrade is the world's leading prediction market though I haven't seen any details on the accuracy of the predictions. They are based on actual money invested so its people putting hard earned money at risk. Probably much better than a random poll of 1,000 people that would rather not have answered the phone. The reduction in the chances of Obama being elected in 2012 could help push the markets up. Otherwise, summer 2012 could be another rough year if the markets have to come to grips with Obama for another four years. Anybody recall the end of 2008 through March 2009? After the close Thursday, Ulta Beauty (ULTA) announced earnings that easily surpassed estimates. Earnings came in at $.38 versus estimates of $.32 and 72% higher than last year on only a 22.6% increase in revenue. Revenue beat due to very strong comps of 11.3% over 2010. ULTA appears to be firing on all cylinders with gross margins up 170 basis points and inventory per square foot down over 1%. The ability to grow revenue while decreasing inventory suggests superb inventory controls. Disclosure: Long DKS. Please read the disclaimer page for more details. With news last week that Sears Holdings (SHLD) would be selling Craftsman tools in Costco (COST) stores, Eddie Lampert has hopefully ushered in the era of breaking away from a retail store based operation. Ever since Lampert bought Sears and Kmart, investors have been looking forward to the day that the company would focus more on selling the brands worldwide and monetizing the massive real estate assets versus focusing on a dying retail operation that seems utterly lost. This has to be the least covered story of the day. With everybody focusing on the Bernack, Obama, and even China inflation today, everybody seems to have missed that not only has the recession likely been taken off the table, but most economists now call for around 2.5% growth this quarter. Even Goldman Sachs (GS) is going to likely raise their estimates for Q3 GDP from 1% to maybe as much as 1.5%. Remember they originally sparked a ton of fear when the supposed experts at GS reduced growth to such a meager level a few weeks back. Interesting that so many 'experts' had previously stated that the US was already in a recession or was definitely headed into one, but now Q3 will be back to near standard growth. When reading through the recent Salesforce.com (CRM) Dreamforce Analyst Session presentation (obtain from the upper right hand corner box), a reader should be constantly struck by the desire to grow at all costs. Both Sales & Marketing and Research & Development costs soared beyond the rate of revenue growth. Another striking point is slide 55 that shows how the FY12 Guidance Midpoint for revenue has increased by $185M or roughly 9% while the Non-GAAP EPS has dropped. Now the earnings drop is mostly associated with the purchase of Radian6, but it further highlights how CRM is buying revenue. Disclosure: Long MSFT. Please review the disclaimer page for more details. U.S. Renewable Firms Going Bankrupt, What About Investing in China Counterparts? Back in February, I did a webinar for Covestor and highlighted that renewable energy was my least favorite sector due to the expected reduction in subsidies in Europe. Witin the last couple of weeks, numerous US solar companies have gone bankrupt including the infamous Solyndra that US President Obama visited. The biggest cause for the bankrupties has been the claim that China subsidizes their solar industry to the detriment of US firms. Considering the previous negativity on the sector, the thought crossed my mind that the collapse of competition and continued high prices of oil and gasoline might make the sector worth another look. Walter Energy (WLT) is a leading met coal pure play not only in the US but in the world. The stock is up nearly 30% this morning on news of a potential bid from Anglo American at $120 share. While yesterdays closing price of $75 does make a $120 bid appear attractive one needs to step back and realize that the stock traded over $130 as recent as the end of July. Not many long term investors would be willing to take such a low price. 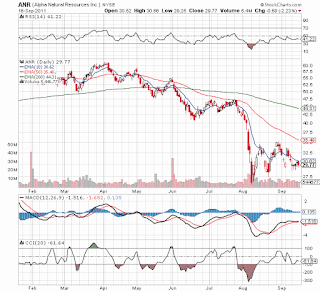 This stock along with our favorite met stock, Alpha Natural Resources (ANR), and the sector have just been crushed with the fear of a global recession. Ironically the main growth drivers of China and India don't appear to be weakening much at all. The assets of ANR and WLT remain just as attractive as it did back in July. 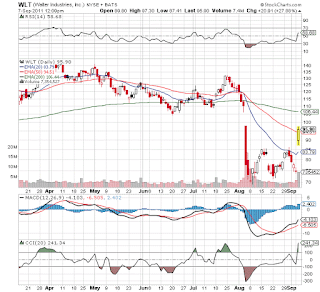 WLT has a 52 week high of $143.76 and I'd expect any accepted offer to exceed that price. ANR appears more attractive with a much larger met coal reserve base. The stock also remains over 50% below its 52 week high of $68.05. Not much talk today about the stunnng reversal in gold for the second time in the last month. Gold has now made two attempts in overnight markets to break above $1,900 and more specifically the $1,915 to $1,920 range. Both times the move has failed miserably. Interesting to see the home page of Seeking Alpha this morning featuring the potential move of gold going to $2,000. Ominous sign of a peak? Ciena (CIEN) soared after reporting an EPS beat and non-GAAP profits for the first time in several quarters. CIEN had a impressive mix of improved revenue combined with a reduction in operation expenses. The real question is whether this combination can last in the competitive environment. Ciena has long been a leading optical and networking equipment provider back to the internet bust in 2000. Since the bust, CIEN has had some good periods, but it has never been able to flourish. The company continues to make lower highs every 4 or so years with peaks around 2004, 2007 and 2011. Good news before the opening today from United Technologies (UTX) as it reaffirmed 2011 guidance of $5.35 to $5.45 per share and %58B in revenue. The European Union could collapse and completely washout this guidance, but it very encouraging to see a major industrial to keep guidance intact after the weak markets in August and the start of September. For those betting on a collapse in earnings estimates, UTX says not so fast. Jeff Kleintop of LPL Financial speaks to the Breakout crew over at Yahoo on the difference between sentiment indicators and actual data. As Stone Fox Capital has been saying for a few months now, the data such as retail sales, industrial production, initial jobless claims, yield curves, and leading economic indicators have been relatively strong or at least not indicating a recession. On the flip side, the sentiment data such as consumer confidence and the regional fed manufacturing data have been bad. The Philly Fed indicator is the main number that triggered the panic, but in reality this number records sentiment and not actual manufacturing activity. Note how the ISM reported 50.6 for August though Philly Fed was negative 30. Clearly the reality is a ton better than the sentiment. Guess the question is which one catches the other. Considering the weak government jobs report today, its interesting that the Monster Employment Index (MEI) hit a post recession high in August. With the doubts over the validity of the government report, why not look at this index instead combined with ADP and jobless claims. All of the other jobs reports were mostly encouraging. Jobless claims have been flat around 400K, ADP showed 91K jobs gained, and the household survey had 330K in gains. Honestly Stone Fox hasn't used the MEI in the past so understanding what the data represents isn't probably 100% accurate. The MEI is reportedly a gauge of US online job demand based on real-time review of millions of employer job opportunities culled from a large representative selection of career Web sites. Anybody wanting to debate what Europe should do with specifically Greece and possibly Italy and Spain should look no further than the results from Iceland (default) and Ireland (austerity). Iceland just exited the IMF program as a success and though Ireland is muddling along it has at least returned to solid growth. The Bond Vigilantes blog has a good post on the two options. Clearly the best path is to decisively pick an option and move forward. Both countries are moving forward while Greece continues to flounder. The problem with Greece is that austerity plans and the lack of growth initiatives are killing the country. Less government spending leads to a smaller economy and in the end it makes no progress on the debt plans. Ok, so that's a catchy title to correspond with the new Facebook app that Monster Worldwide (MWW) created to counter the trend towards social media recruiting especially by LinkedIn (LNKD). In reality, 2011 has been the year to not own MWW. Clearly any investor holding this top S&P 500 loser all year doesn't want to be known by the public. Times might be changing though as anybody buying since mid August could've participated in the 21% gain on Tuesday. Disclosure: No positions, but might purchase MWW within the next 72 hours. Please review the disclaimer page for more details. If anybody wants a growth company trading at a cheap valuation, recent IPO C&J Energy Services (CJES) might just be the stock for you. CJES is a independent provider of hydraulic fracturing, coiled tubing and pressure pumping services operating mainly in the Eagle Ford and Haynesville Shales. The company IPO'd at the end July and has traded down from the $29.50 IPO price even with initial trading reaching $33. CJES reported Q2 adjusted earnings of $.78 versus $.60 in Q1 and $.04 last year. Revenue jumped 43% from Q1 to $182.2M and a amazing 336% from Q210. The majority of growth is from deploying additional hydraulic fracturing fleets with minor gains from the Total E&S acquisition that added $4.5M in revenue or roughly $2.2M per month. After the markets closed tonight, Brazil cut interest rates 50 basis points to 12% from 12.5%. Wow! Guess I haven't paid enough attention to the Brazil economy as I was not expecting an interest rate cut much less a 50 basis point cut. Many an investor would probably be surprised to realize that Brazil interest rates remain as high as 12% after a big rate cut. Apparently this move caught investors off guard as the expectation was for a 25 basis point cut if at all. With inflation running around 7%, I'm surprised as well though inflation rates should moderate as material costs maxed out earlier this year. Year over year numbers will eventually subside as 2012 rolls around.